Flyers serve an important role in any marketing campaign, especially in events and product launches, flyers have been proven as an effective tool in providing an easy and convenient way of communicating information to your potential customers. This is the reason why a lot of companies have employed the use of flyers in their promotion and marketing efforts. Having said this, an attractive flyer design will undoubtedly help anyone interested in promoting a specific product. But let’s face it, not everyone has access to skilled graphic artists and designers when creating these flyers. 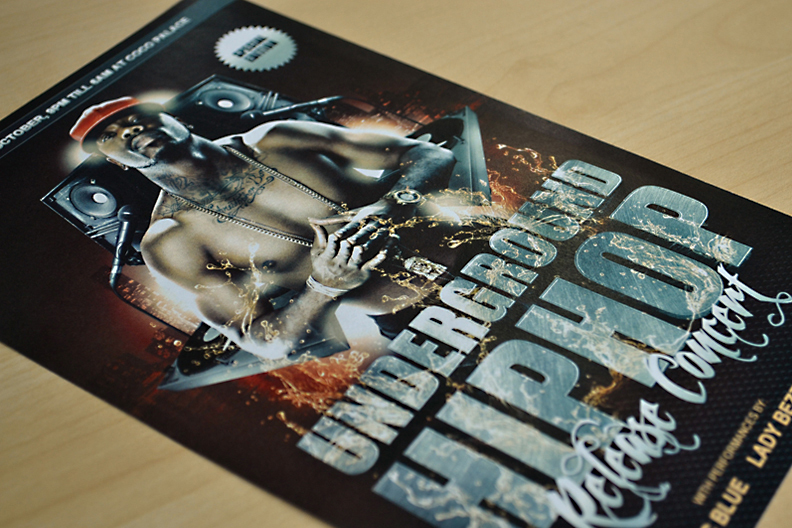 Fortunately, the You The Designer team has got you covered with this amazing tutorial on how to make a hip hop inspired concert flyer. Before we begin, let’s get some things ready. Download the 4″ x 6″ Club Card Flyer Template at the Uprinting’s Template Page (Go to the “Templates” tab > Select Adobe Photoshop as the application format > Click the “Download” link for the 4″ x 6″ file setup). Make sure to set up the font on your computer before getting started with this tutorial. Notice that our downloaded template is on CMYK mode, it’s easier and more accurate to edit the artwork when it’s on RGB mode, so change it by going to Image Menu > Mode > RGB Color then select (Don’t Flatten). Now we are all set to make an awesome Flyer. Open the picture of the Rapper on Photoshop and trace its edges with the pen tool (P) for shortcut and paste it to your canvas like this. Now we’ll color the background with black and red gradient. Go to the layers panel and double click “Background” layer. On the layers panel, select “Rapper” layer. Notice that the picture looks a little flat so we’ll make it pop by tweaking some elements. Hit CTRL+SHIFT+L, to go to the Auto levels Menu. Notice that it neutralizes the levels of your picture. Next, we’ll duplicate the “Rapper” layer by pressing CTRL+J. It will produce a layer named “Rapper copy”. Change its blending mode to “Soft Light”. Now look on the upper part of your screen, go to Filter > Other > High Pass, I set mine to 14 px. Notice the difference? Now merge these two layers (Rapper layer and Rapper copy layer) by holding CTRL while clicking layers. When you get these two layers selected, hit CTRL+E to merge them. Sometimes the effects of merging layers may result to unwanted white lines around the edges of your picture. So to remove it, go to Layer > Matting > Defringe, choose 1 px and hit ok. Now you’ll have a polished edged picture. I decided to make his pants black by hitting CTRL+U (Hue/Saturation) and following this setting. Make more adjustments by following the settings below. The shortcut for Levels and Curves are CTRL+L and CTRL+M respectively. Let’s take a look at the before and after. Notice that the picture looks more serious and thuggish now. How to work the Healing brush tool? Hold ALT and click it to a smooth part of his skin then release ALT and click it to the blemished part of his skin. To bring more contrast to the picture, just press “O” for shortcut. Use burn and dodge tool with Midtones range and with 30% exposure. The Burn tool works by brushing on the dark parts of the photo, while the Dodge tool works by brushing on the lighter parts of the photo. You should always adjust the size of the brush depending on the size of the parts, just don’t overdo it because it will look bad. You should have something like this. Open the picture of Manhattan Skyline on Photoshop. Desaturate it (CTRL+SHIFT+U), select canvas (CTRL+A), copy it (CTRL+C), go to your Flyer and paste it (CTRL+V) behind your main subject and change its blending mode to “Overlay”. Erase some parts of the top and bottom edge of the skyline picture to blend it with your background. Your flyer should look like this. Next, we’ll add pictures of a bass speaker, a microphone and turntables behind him. Make sure to apply all the previous adjustments/dodging/burning to all these supporting elements just like what we did with the main subject. Open Adobe Illustrator and create a new document (CTRL+N). Make a screen shot of the flyer in Photoshop and paste it in Illustrator. Start typing the event title using Impact font. Select the text and press SHIFT+CTRL+O to outline it. Now go to Effect > 3D > Extrude & Bevel and follow these settings. Highlight and copy the text then paste it as “pixels” in Photoshop. Now using the Magic Wand Tool (W) Highlight the white parts of the text, use SHIFT to highlight multiple selections and hit CTRL+J to make a copy of it. Name it “Title_Top” and the layer on the bottom of it “Title_Bottom”. Then, open the Metal texture in Photoshop, desaturate it (SHIFT+CTRL+U) and paste it to your flyer. Make sure that this layer is on the top of “Title_Top” layer. Select it both and while pressing ALT place your mouse on the red circle and you’ll see a basket-like icon. Clicking on this icon will make the metal texture go inside the text. You can scale it according to your taste by just selecting only the Metal Texure layer and hitting CTRL+T. This is what I came up after scaling. Now merge (CTRL+E) the “Metal Texture” and “Title_Top” layer. Make the text darker by dragging the curves lower. Do the same for the “TItle_Bottom” layer. Make sure to make it really dark by dragging the curves even lower. Now your artwork should look like this. To give the Event title a more 3D look, double click “TItle_Top” layer and follow these settings. Open the black background of circle texture in Photoshop and paste it on the flyer, make it smaller and flip it vertically (CTRL+T and Right click). Erase the top edge part of it using the Eraser tool. You should also use this tool to erase the lower part of the rapper. Add a drop shadow to the “Title_Bottom” by double clicking it and following this setting. Now your picture will look like this. 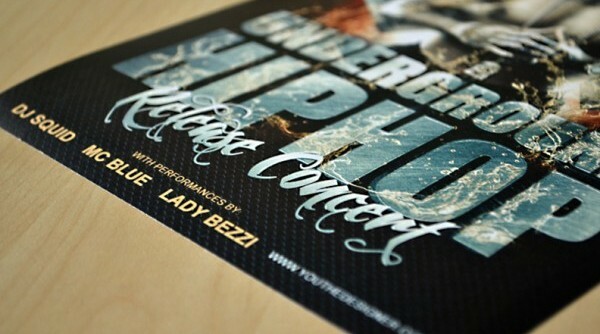 Open the water splash image in Photoshop, Invert it (CTRL+I) then put it on the flyer. Change its blending mode to “Linear Dodge (Add)” then place it on the text like this. Duplicate it and flip it horizontally, place it on the bottom text. Using the Eraser Tool with 70% opacity and 0% hardness, gently erase some parts until you achieve this look. We’ll now add more lights coming from the back. Select the first layer at the bottom then create a new layer (CTRL+SHIFT+N) and name it “Lights”. Using different sizes of circle brush with 0% hardness and 100% opacity, I brushed something like this. It should look like this when the whole artwork is visible. To finalize the light effect, go to the top-most layer, create a New Layer and name it “Subtle_Lights”. Using same circle brush we used earlier but now with only 30% opacity, I brushed over some parts of the rapper. You should notice the overlapping lights on some parts. Next, double click that layer and copy this setting. Now you’ll have this kind of glow. draw a long rectangle on the top of the image. Color the rectangle by double clicking it and following these settings. We’ll now use the Feathergraphy font to spice up the event title even more. The effects on this text is the same as the one we used on the previous text. Switch the document back to CMYK and there ya have it! You’re awesome Hip Hop Flyer is done. For questions, suggestions and any reactions regarding this tutorial, just leave a message by commenting below. If you’ve got any request or a crazy idea you’d want to share with us, just hit us up on Facebook , Twitter or G+. For more tutorials, or design news and inspiration, stay tuned and subscribe to our RSS Feed! Stay awesome everyone!